Using new electroencephalogram (EEG) technology, which records brain activity, it’s possible to drive a car using your mind or make an object on a screen smaller just by thinking about it. There’s so much to be excited about with this and other emerging technologies, but in education it’s only really the champions – the early adopters – that are currently benefiting. It doesn’t have to be that way. The EEG technology that’s used to do those mind-blowing things is easy to set up, and there’s no need for power, so it has myriad uses. A VR simulator, for example, could be used to train cabin crew on an aeroplane that’s flying through turbulence, while the EEG technology measures stress. Trainees might be very anxious the first time, but learn to manage their stress effectively by the fifth rotation. This gives a better understanding of what people are experiencing, which could improve training methods. We've worked with AR at the University of Manchester Medical Centre role-playing practical examinations. Medical students must show they’re competent at communicating effectively with patients, taking blood, administering antibiotics and stitching wounds. AR is used to give them an understanding of the equipment, reinforcing how to use it properly with limited supervision. Other organisations are doing great things in this space, too. A problem in medical schools is that students have limited access to cadavers, so a company called Medical Holodeck is using simulated patients with real MRI and CT scans from anonymised patients to allow students to diagnose and recognise conditions virtually. Immersive technology is also being used to help humanise experiences. For example, nurses could be placed into a virtual situation to practice giving bad news to a patient - then the situation is flipped, so the nurse can embody the patient. Research shows that we empathise more if we can experience a situation such as homelessness through another's eyes. It’s the same for criminals: someone who’s been arrested for racist behaviour could use VR to place themselves in their victim’s position. This method has been shown to reduce the amount of racial bias, at least in the short term. In the futures team, we spend time talking about good practice across a multitude of areas. I met people at Pixar to see what we can learn from their processes, about the dynamics between teams and the technologies that they use to streamline their approach in filmmaking. 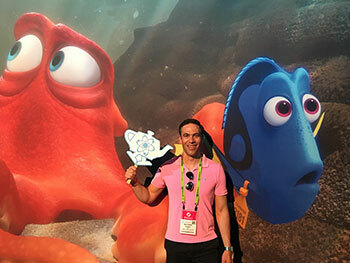 Disney does a lot of research in immersvice technology too, looking to monetise its computer generated assets beyond films, in areas such as VR, allowing experiences to prevail across multiple viewing mediums. In addition, Disney has developed Project Cardinal, a tool to dynamically translate initial scripts to VR for draft pre-visualisations. And when Apple recently launched its AR toolkit (ARKit), I was able to talk to software engineers directly. I told them about Jisc, showed them what we’ve done and discussed how they might link with education. AR and VR are often best as 20-minute supplementary experiences. They don’t usually work in isolation, but instead complement conventional teaching and learning approaches. These technologies are efficient in communicating subject matter that is traditionally theoretical and abstract. That’s where I think immersive experiences will take over in learning in future – especially when we can deliver them in any browser, device or wearable items. That’s when massive waves of people will adopt AR and VR in education. We’re currently putting together an AR/VR immersive technology service. This has been ad hoc before now, so institutions could collaborate with us, but there wasn’t a nailed-down offer. We’re now developing advice and guidance, pulling together a framework of companies to recommend to our members. Often, what we see in institutions is that the first project acts as a catalyst. For example, some of the VR work we did with Preston’s College spawned a number of other initiatives, which the college was able to scale up internally. We showed what was possible with the technology at a low cost, and the college staff took it from there. Now, we’re collaborating to develop immersive tech with a pedagogic backbone. We’re looking to solve problems, not just show shiny new technology – and now, as well as working with champions - we’re reaching out to other institutions that want to dip a toe in the water. It’s not about short-termism. We aim to look beyond the horizon and explore how future technologies can potentially disrupt the education space. If you are interested in learning more, you can book a place on our training course: introducing augmented and virtual reality in education, which takes place on 14 May at Weston College in Weston-super-Mare.